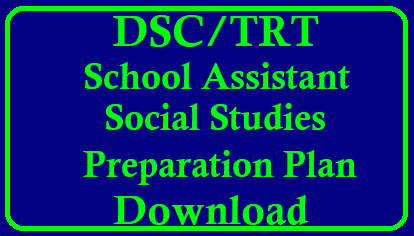 Thanks for G. Saideshwara Rao Sir from Khammam for providing this DSC/TRT Social Studies Preparation Plan for the DSC/ TRT Aspirants who are going to appear for TRT Social Studies Exam very soon. The Plan which the sir has provided contains How to have an awareness of Syllabus,Social Content Preparation , Methodology preparation, How to get good marks in the Subject and what are the books to follow by the aspirants. Hope this preparation plan will be very much useful for them to get good marks in their respective subject. In DSC School Assistant examination, Social Studies have distinct feature in respect of syllabus, exam pattern etc. compared to other paper most important factor is allocation of maximum marks for the subject questions. In other subjects 70 marks were allocated for subject where as Social Studies have 100 marks. And one more aspect to note that methodology and content were combined in Social Studies School Assistant exam. With this reason aspiring candidates of School Assistant (Social Studies) posts should have different approach in view of preparation and should adopt scientific approach. The following are the topic wise tips and areas to be focused for aspiring candidates of School Assistant Social Studies. In this topic candidates should focus more on solar system and Earth; Earth and interior of the Earth, Major Land forms, Climatology, volcanoes, Earthquakes, Hydrosphere, Natural Hazards, major natural regions of the world, continents, world population, Geography of India and A.P., and Telangana. In History part Pre Historic Age, Proto-Historic Age, Historic Age, Bronze age civilization, Early Iron Age Societies, The medieval world, Ancient Indian Civilization, Political and Religious Developments of 6th Century of B.C., India from 200 B.C. to 300 A.D, India from 300 A.D. to 800 A.D. Deccan and South Indian Kingdoms, The Muslim Invasions in India, Delhi Sultanate, Mughul Empire, Advent of Europeans, Cultural Heritage of India, India between 1858 to 1947, Rise of Nationalism are important topics. And also two world wars, imperialism, nationalist movements are most important topics to read thoroughly. As named as vast subject, Economic preparation should be in different approach. From broad meaning of the term Economics to latest developments in Economics are important to read carefully. Candidates should understand the concepts of economics and their applicability latest economic reforms from regional level to international level. And they should understand the implications and effects of economic reforms happening globally. In general civics subject seems little interesting compared to other one. As topics like family system, state and central relations, parliament system, legislature bodies, democracy system, Lok Ayuktha, Human Rights organizations are in general perspective. But candidates need to understand the concepts of all the areas and they should have special focus on Indian Constitution right from framing of the Constitution drafting committee to consent to the constitution. And they should also have knowledge on the latest developments with regard to constitutional amendments and their implications, reasons of making such amendments etc. It is important to each and every candidate to prepare with special focus for Methodology. It is deciding factor in selection. Hence candidates should have sound knowledge in the topics especially in Social Studies, scope and values, nature, lesson plans, teaching methods, evaluation. Chronological order to be followed in preparation of topics which are inter-related. For example, at the time of studying topic on Earth system it is better to read all the topics from 6th to intermediate level in a row. In Geography it is very important to have in-depth knowledge in Earth and its nature and climatic conditions. And knowledge in Atlas and map pointing and identification of various places on map are must for every candidate. In History focus on world history will give special advantage. And for the topics medieval history, capitalism, industrial revolution read9th and 10th class books. In Economics awareness on banking system, Indian economy, inflation etc. are very important. In methodology lesson plans, teaching methods, evaluation aspects are important to read without negligence.